If you’re on Windows 7 and your touchpad suddenly stops working, you’re not alone. Many Windows users are reporting this problem as well. But no worries, it’s possible to fix. 2) Expand Mice and other pointing devices. 3) Right-click the device name and select Uninstall. 4) Check the box next to Delete the driver software for this device. Then click OK.
A hard reset is a procedure that helps you clear the driver instructions. You laptop will reload all the instructions from the drivers and software stored in your operating system which can help to solve some problems. This procedure will not erase any data from your computer since it is not a reformat of the operating system. Please be relaxed. Here is how you could do the hard reset. 1) Turn off the computer. 2) Remove the computer from any port replicator or docking station. 3) Disconnect all external connected peripheral devices such as USB storage devices, external displays, and printers. 4) Unplug the AC adapter from the computer. 5) Remove the battery from the battery compartment. 6) Press and hold down the Power button for about 15 seconds to drain any residual electrical charge from the capacitors that protect the memory. 7) Insert the battery and plug the AC adapter back into the notebook computer, but do not connect any of the peripheral devices. 8) Press the Power button to turn on the computer. 9) If a startup menu opens, use the arrow keys to select Start Windows Normally, and then press the Enter key. 10) After reconnecting each of the peripheral devices, run Windows Update to update all device drivers. Your touchpad problem is probably being caused by driver issues. The steps above may resolve it, but if they don’t, or you’re not confident playing around with drivers manually, you can do it automatically with Driver Easy. 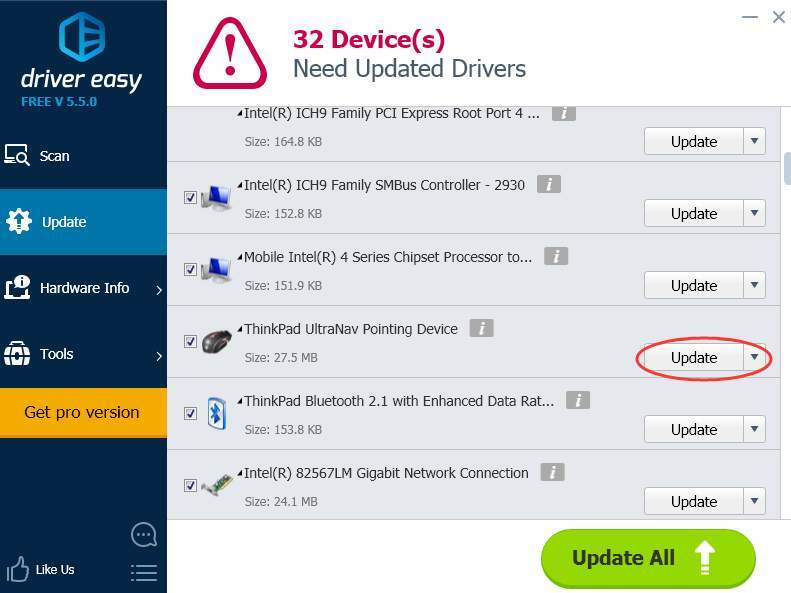 3) Click the Update button next to the flagged touchpad to automatically download and install the correct version of its driver (you can do this with the FREE version).